We (two couples) stayed in this unique apartment for a week in August and found it to be a wonderful location for visiting Sydney. The bus line is 1/2 block away, the restaurants are awesome in Surry Hills, and the shopping is interesting. Loved Chee Soon & Fitzgerald for shopping and Kylie Kwong\'s Restaurant is worth the wait. This apartment was a great find and Lindy is wonderful. We had a great stay in April and absolutely loved the location. The house was very large and I loved sitting out on the deck with my coffee and breakfast from Bourke Street Bakery (around the corner and not to be missed). The house was very clean, comfortable, safe, with friendly neighbors. We enjoyed our stay in Surry Hills tremendously. 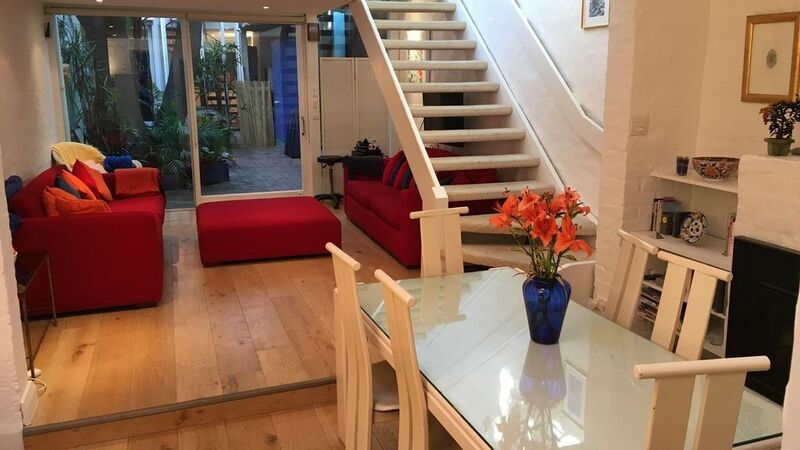 The house offers more space and facilities than any hotel room could, it\'s located in a very central, convenient and pleasant part of town with great public transport or the chance to walk. Great food and restaurants are close by, too.The flat itself is beautiful and very tastefully decorated, yet it has a \"lived in\" feeling to it which makes it very welcoming. We will definitely stay there again when coming back to Sydney. This unusual and exotic house is opposite a park and comprises of two pavilions facing each other across an internal courtyard, which is canopied by a fifteen metre Chinese Tree of Heaven. The front pavilion is a three story glass tower: the top floor containing a bedroom with a queen size bed(1000 Threadcount sheets) and television, the next level, a bathroom and second bedroom with a queen size bed (1000 Threadcount sheets). A spiral staircase leads down to the ground floor study, which contains a queen size sofa bed, tel/fax, scanner,copier, colour printer and wireless or ethernet broadband connection. The study opens into the courtyard. A walkway crossing above the courtyard from the second level leads to a sundeck and the second pavilion. Stairs go down into an open living room and dining area with polished timber floors and a gas fireplace. The fully appointed kitchen (smeg and bosch appliances), laundry (miele appliances) and toilet are adjacent to this space. The living area contains a stereo sound system with ipod connection, lcd television, dvd player, Foxtel cable channels, and opens onto the internal courtyard which houses the gas barbeque. The house is peaceful and filled with sunlight. It's in such a handy location - close to shops, coffee bars, cafes, bus route - and very walkable to Central Station. Lots of room. Property was lovely but needed a little attention. Very different which we liked but a little shabby in parts. Would still recommend it though as it was unique. We loved our stay at the Oasis...welcomed by fresh fruit and flowers and helpful tips by the owner. A fabulous property for families, our family of 6 fit comfortably. We loved the fireplace and courtyard too. Would thoroughly recommend. Really close to fantastic restaurants, transport, SCG, city and central station. This place was a real find. We have visited our son in Sydney a number of times and wanted to find somewhere to stay that was more than a souless apartment. For us (two couples) this was absolutely ideal for our three week stay. The location is excatly what you would want, right in heart of Surry Hills and a very easy walk to Oxford Street, Paddington, CBD etc. Making the booking arrangements with the owner was very easy and Lindy was extremely helpful providing detailed instructions and suggestions ahead of our stay. Once inside the house opens up to provide a unique space which the photos can only partially convey. Having stayed in many holiday lets, this one was a real suprise when we realised that all the everyday basics and more were there already - fresh flowers, a good stock of kitchen ingredients, soap, towels, washing powder, dishwasher tablets, toilet rolls etc, etc. We loved the layout which was bright, airy and had a lived in appeal that suited us just fine. Lindy was concerned about some forthcoming renovations to the kitchen and went out of her way to make sure that we were not disturbed when the builder came to take measurements - the kitchen was fully equipped and any changes can only make it even better. We had one very minor problem with the internet connection for a couple of days but Lindy, again, went well out of her way to sort it out with the telecoms company (and we all know what a challenge that can be) in record time. This place is at the top of our list for a return visit. To start with the owner is really helpful, polite n kind! Second, the house is great, big rooms, great deck upstairs, the house has everything that u need! Finally, location! Surry Hills is an excellent suburb, near to restaurant, cafes, supermarkets....I'd definitely be back to this place! Great tenants it was a pleasure to have them stay come back soon!!! Location of this property is fantastic! We were about to walk EVERYWHERE or the bus stop was directly across the road. You are within walking distant to the Sydney cricket grounds, Central Station, the city centre, Darling Harbour and all the attractions that Sydney has to offer! The house was huge and the kids love the spiral staircase! The beds were incredibly comfortable and the roses of the bedside table were beautiful. The house was full of fresh flowers and a bowl of fruit which the kids really appreciated after a long day of travel. Linda was very friendly and there was a lovely welcome phone call to ensure that everything was fine on our arrival. The area has the most amazing restaurants, grocery and a gelato bar well worth lining up for!